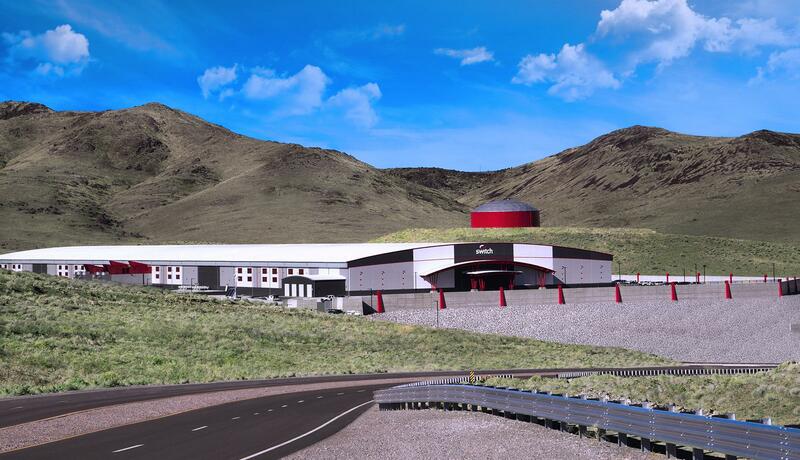 Switch TAHOE RENO 1 Data Center is the largest, most advanced colocation facility in the world. RENO, Nev. — Switch, a globally recognized leader in future-proof data center design, superscale cloud, unparalleled telecom gateways and energy sustainability, today announced the opening of the largest, most advanced data center campus in the world – also known as The Citadel Campus. It is designed for up to 7.2 million square feet of data center space and up to 650 megawatts (MW) of power. The 2,000 acre campus, located in the Tahoe Reno Industrial Center next to the Tesla Gigafactory, is powered by 100-percent renewable energy, cementing Switch’s deep commitment to industry-leading green energy. TAHOE RENO 1, the first data center at Switch TAHOE RENO, sets a new level for scale as the single largest colocation data center facility on the planet, encompassing up to 1.3 million square feet and up to 130 MW of power capacity. Like all Switch data centers, TAHOE RENO 1 is designed to accommodate future-proof, high-density deployments, high-performance workloads and always-on applications across a wide spectrum of industries and technical requirements. All Switch TAHOE RENO data centers are designed and built to the advanced standards of the world-renown Tier IV Gold-rated Switch LAS VEGAS multi-tenant data centers. Based on more than 260 patent and patent-pending claims developed by founder and CEO Rob Roy, Switch data centers continue to exceed all industry standards. The Switch TAHOE RENO data centers are connected to the Switch SUPERLOOP, a 500-mile, multi-terabyte fiber optic network that provides active/active connectivity to San Francisco and Los Angeles as well as the company’s 2.5 million square feet of data center space located in Las Vegas. This enables clients to build resilient, always-on IT infrastructures to support continuous business operations. The route through Nevada, coupled with the complete SUPERLOOP pathway through the State of California, delivers the most direct and diverse path for data to reach its destination with the lowest latency connectivity, at 4 and 7 milliseconds respectively. The SUPERLOOP allows Switch’s more than 1,000 clients to deploy a low-risk, low network latency IT infrastructure for mission-critical workloads. In addition, SUPERLOOP connects Switch’s clients to more than 40 million people through fiber optic communication to California’s Bay Area and the Los Angeles metropolitan area in sub-10 milliseconds. Switch customers value the company’s reputation and track record for operating the most reliable and secure data centers in the world.